The world of publishing was in raptures today as it was announced that lost Barney Thomson short story classic BARNEY THOMSON & THE FACE OF DEATH has, for the first time, been released as an ebook by renegade guerilla digital publishers, Blasted Heath. Originally published in 2002, BARNEY THOMSON & THE FACE OF DEATH is a 17,000 word short story set between the second and third novels in the series, while Barney is wandering the Highlands and getting in adventures. The initial print run of 500,000 copies sold out many years ago and for political, cultural, philosophical, legal and religious reasons has never been reprinted. Now, in association with Douglas Lindsay, Blasted Heath have stepped in to save the book from being lost in the netherworld of publishing extinction. 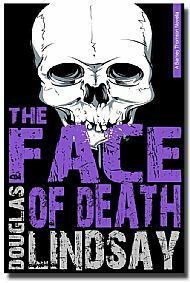 Retitling the book simply THE FACE OF DEATH, and bringing to it an iconic skull motif, Blasted Heath have given the project a new and exciting lease of life. While some naysayers are questioning the true place of THE FACE OF DEATH in publishing folklore, others, such as Professor Malcolm Connery of the Glasgow Institute of Special Things, have no doubt as to the significance of this publishing event. Douglas Lindsay, 67, was unavailable for comment.